I think I may just become a "professional eater". Seems that I'm well on my way to this new position, having now been a judge at four tasting contests in Collinsgwood this season. Three at the Collingswood Farmers' Market: Salsa, Peach and Apple Pie contests, and the Chili Contest at the Fall Festival in Knight Park. The Fall Festival is an event sponsored by the Collingswood Borough Elementary, Middle and High School PTA's. Held in our large park, called Knight Park, schools gather together to showcase their PTA and to raise money for them. There is food for sale, games and entertainment for kids and adults and it's a way to come together outside as a community. 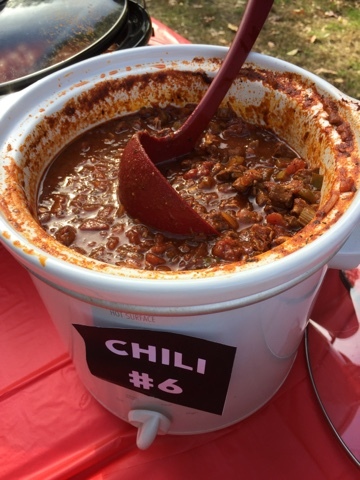 My friend, Kate Thomas-Arter, asked me to step in and be a judge for the Borough's annual Chili contest at the Fall Festival this past weekend, Rather than be a contestant and try to figure out when I was going to have time to make a crock pot full of chili, I jumped at the chance to be a taster instead of a contributor. I knew this contest would be a good one and it wouldn't make me have a sugar melt-down like I experienced from the last two pie contests. If one paces oneself, sampling chili might not be such a bad way to spend a lunch hour. Our picture perfect autumn afternoon was an idyllic day, crisp air, beautiful light, several hundred people from the community enjoying music and hay rides. I had to pinch myself to make sure I wasn't watching some Hallmark Television program, that what I was experiencing was truly real. The video posted above was a quick scene I shot and tweaked in the editing to cut out a few seconds of blank movement. The performer's song and the moment were so in sync with each other that it would have been a waste to not capture the moment. If only I hadn't been quite so shakey with my hand-held movements. No matter, the feelings are visible. The Chili Contest consisted of 11 entries, 10 of which were there at the beginning, with the 11th entry arriving a few minutes after the five judges started to taste all the chili. I'm not positive all the judges got to sample chili number 11, so I should say that there were only 10 that were part of the official tally. Of the 10, only two were vegetarian. There were four that had cuts of beef, one with ground turkey, one white chili (vegan), and one true Texas Chili - no beans, no tomato, just beef and chili powder and spices. 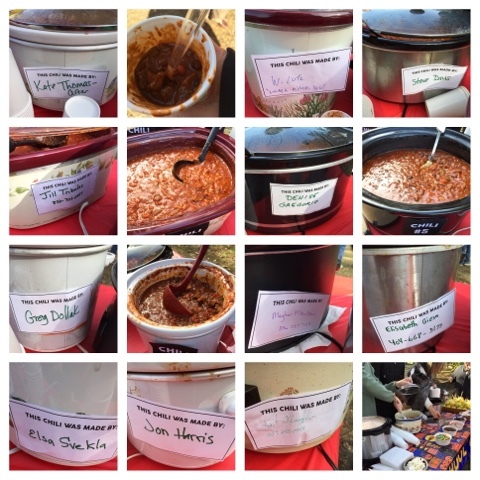 Most of the chili's entered into the contest had a kick - people didn't shy away from the spices! I tasted one that reminded me of a Cincinnati style chili - slightly sweet, finely ground beef, with a hint of cinnamon. Most chilis were dark, with nuanced flavors. One or two had hints of bread/yeast/beer, and there were two that were more soup-like than chili-like. Two were more stew-like than chili, hearty and filled with chunks of meat and vegetables. There was truly a chili style for everyone. The judges handed in their votes quickly, except for me. I was too busy taking notes, sniffing ingredients and savoring bites. I ate slowly and I took small samples. The votes were counted in private so I don't know if we had a tie in any category. Unlike the Farmers' Market contests, there weren't various categories to judge. This was a straightforward affair, 1st, 2nd and 3rd place. 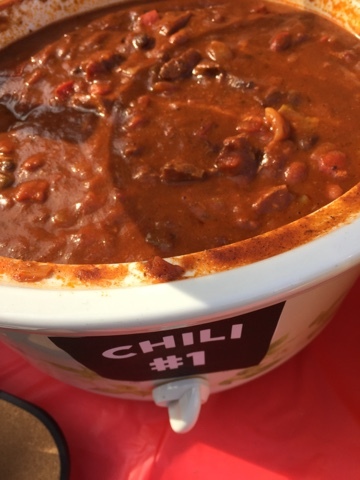 1st Place was awarded to - Chili #4, Jill Tribulas. This was a deep red colour, nice bite, great mouth-feel and spice. I noted that it was an Autumn Pleaser. It was in my top 3 picks. 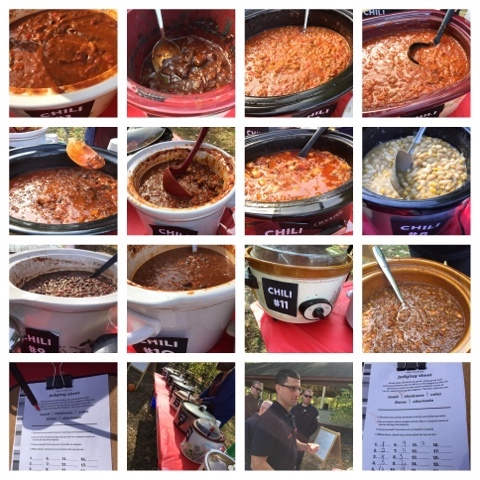 2nd Place was awarded to - Chili #6, Greg Dollak. Greg was a Peach Pie contestant, making a good pie and now a great chili. His entry was stew-like, with cuts of tender meat, peppers and a lot of spice. I listed that I liked it very much. 3rd Place was awarded to - Chili #5, Denise Gregorio. Denise, is the mother of one of my son's classmates, so we know her and the family well. I made sure I didn't know who made the chilis before I tasted them, so that I wouldn't be biased. I'm glad I was sure to be a "blind-taster", Denise's chili, along with a few others were cooked by friends. 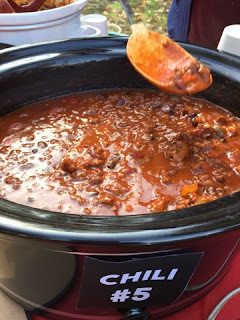 Denise's chili had a bite that lingered on the tongue, giving it a kick that kept on kicking! 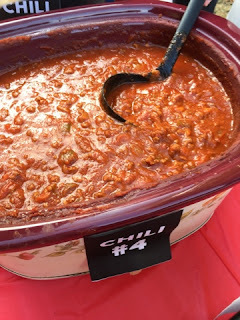 Thick, ground meat and lots of beans, this too was another chili that I noted i my top five favorites. As for my other favorites, Chili #1, took my vote for #1. This turned out to be made by our friend, Kate, who asked me to be a judge. As I mentioned, I didn't know who made which batch. I really loved Kate's chili, so much so that I wanted to get some to take home. There was none left at the end of the festival. After our tasting contest, all the chili was then offered for sale to festival-goers. Kate texted me later to say she couldn't give me any, it sold out! She made several batches in order to test out her recipe. It may be a long while before she makes another batch again. You and I will have to be content with her recipe instead, which she graciously shared with me. This dark red, cocoa-infused chili was tinged with tomatoes, cumin, and filled with tender stew beef. It packed a spicy punch too. Sauté onion and peppers in oil, set aside. Salt and pepper beef, and sear beef in batches in small amount of vegetable oil. Cut into small pieces, deglaze pan. Add meat (and its juices) and vegetables back in and add seasonings. After coming to a boil, simmer for 2 hours, best the next day. "I needed to add a little more chili powder and garlic powder, and I also did a cornstarch slurry, because it was a little too liquidy." A cornstarch slurry is a teaspoon of cornstarch added to a quarter cup of cold water and stirred. You then pour a bit of the slurry into the chili and stir. As the chili heats up, the cornstarch acts as a thickener. Only use a bit at a time, otherwise you may end up with something too thick or like paste!